Citation: Galdino ACM, Branquinha MH, Santos ALS. Pseudolysin (elastase B): a protagonist in the Pseudomonas aeruginosa pathogenesis. Microbiol Curr Res. 2018;2(1):1-2. Pseudomonas aeruginosa is an opportunistic human pathogen with huge medical relevance worldwide, since it is associated to both acute and chronic infections with impressive morbidity and mortality rates . This Gram negative bacterium has ubiquitous distribution, being able to colonize a vast diversity of habitats with distinct physicochemical characteristics, such as soil, water, plants, animals and humans . This versatility can be assigned, at least in part, to P. aeruginosa genome plasticity, which reflects in its ability to quickly modulate the metabolic repertoire in order to adapt to the changes in environmental conditions . For all these reasons, P. aeruginosa might cause a wide variety of human infections, with special clinic emphasis in immunocompromised patients [1,3]. Pseudomonas aeruginosa cells are able to produce a myriad of virulence attributes, including both cell-associated (e.g., pili, flagellum, non-pilus adhesins, lipopolysaccharide) and secreted factors (e.g., alginate, exotoxins, hemolysins, siderophores, pigments, proteases), which act synergistically towards to the establishment of the infectious process  (Figure 1). Among the pseudomonal virulence arsenal, pseudolysin is, with no doubt, one of the main protagonists involved in many phases of the P. aeruginosa pathogenesis. Pseudolysin, also known as elastase B, is a classical zinc-dependent metalloprotease that belongs to the M4 thermolysin-like family according to MEROPS database (merops.sanger.ac.uk) . This enzyme is encoded by lasB gene, and its transcription is orchestrated by las and rhl quorum sensing systems . Pseudolysin is synthetized in the bacterial cytoplasm as a pre-proenzyme of 498 amino acids (roughly 53 kDa). After the cleavage of the signal peptide, during its translocation throughout the inner membrane, the proenzyme has its structure stabilized by the formation of a disulfide bond between Cys270 and Cys297 residues. Then, the proenzyme is secreted into the extracellular environment, where the proenzyme becomes in its mature and active form by the dissociation of the pro-peptide . 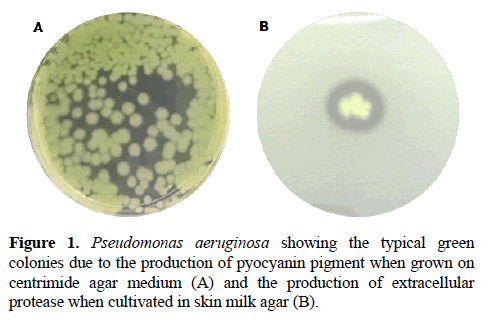 Figure 1: Pseudomonas aeruginosa showing the typical green colonies due to the production of pyocyanin pigment when grown on centrimide agar medium (A) and the production of extracellular protease when cultivated in skin milk agar (B). Pseudolysin was firstly described as an elastinolytic enzyme. However, it is currently well-recognized that pseudolysin could degrade a huge variety of proteinaceous substrates, including key host components. The pseudolysin mechanism of protein cleavage is based on the hydrolysis of non-terminal peptide bonds of aromatic and/or large aliphatic amino acids at the P1’ position . Due to the pseudolysin broad cleaving action, this enzyme could perform a multivalent role during P. aeruginosa infections, and hence its enzymatic activity is correlated with the aggravation of lung infection, development of chronic ulcers, muscle damage, corneal liquefaction and hemorrhagic events. Pseudolysin is the major factor that promotes tissue invasion and damage during P. aeruginosa infections due to the cleavage of extracellular matrix components (e.g., elastin, fibronectin, fibrin and collagen type III and type IV) as well as the disruption of the membrane basement by attacking the intercellular tight junctions and by destroying cell-to-cell and cell-to-matrix adhesion receptors . In addition, the direct proteolysis of host constituents also provides nutrients for bacterial growth and proliferation . Furthermore, pseudolysin helps the bacterial cells to evade the host immune system attack by cleaving humoral components that are essential to the bacterial clearance, such as tumor necrosis factor alpha (TNF-a), interferon gamma (IFN-g), interleukin 2 (IL-2), monocyte chemoattractant protein-1 (MCP-1), complement proteins, epithelial neutrophil activating protein-78 (ENA-78) and surfactants proteins as well as by inducing the immunomodulation of host inflammatory mediators [4,10]. The severity and morbidity of P. aeruginosa infections might be correlated with the pseudolysin overproduction . In this sense, it was observed that clinical strains of P. aeruginosa recovered from critically-ill patients with ventilator-associated pneumonia had an increased secretion of metalloproteases, mainly pseudolysin, when compared with the laboratory P. aeruginosa strain PAO1 . Furthermore, it was demonstrated that DlasB strains were less virulent and induced fewer injuries into rabbit corneal epithelial cells when compared to the wild-type strain . Since pseudolysin is a multifunctional protease acting at the apex of several complex physiopathological events, its inhibition emerges as a promising anti-virulence target to tackle multiresistant P. aeruginosa strains. In this context, several groups are involved in the design of new therapeutically strategies that are purposeful in the inhibition of pseudolysin harmful action. Previously, it was reported that synthetic N-a-mercaptoacetyl-derived dipeptides were able to block the pseudolysin activity and extended the lifespan of Caenorhabditis elegans infected by P. aeruginosa strain [9,14]. Interestingly, pseudolysin develops a pivotal role in P. aeruginosa infections; however, it is not essential for bacterial viability. Therefore, the inhibition of its activity would reduce the immunomodulation and tissue destruction during P. aeruginosa infections without inhibiting the bacterial growth. Thus, the anti-P. aeruginosa therapy based on pseudolysin inhibition would reduce the selective pressure in bacterial cells, as well as it would delay the arise of antibiotic resistance . For this reason, the discovery for new pseudolysin inhibitors should be explored extensively in an effort to propose their use in a therapeutic context, especially in refractory and multiresistant P. aeruginosa infections. Gellatly SL, Hancock RE. Pseudomonas aeruginosa: new insights into pathogenesis and host defenses. Pathog Dis. 2013;67:159-73. Stover CK, Pham XQ, Erwin AL, et al. Complete genome sequence of Pseudomonas aeruginosa PAO1, an opportunistic pathogen. 2000;406:959-64. Crousilles A, Maunders E, Bartlett S, et al. Which microbial factors really are important in Pseudomonas aeruginosa infections.Future Microbiol. 2015;10:1825-36. Galdino ACM, Branquinha MH, Santos ALS, et al. Pseudomonas aeruginosa and its arsenal of proteases:weapons to battle the host. In: Pathophysiological aspects of proteases. 1st ed Springer Verlag GmbH, Singapore. 2017; 381-97. Bever A, Iglewski BH. Molecular characterization and nucleotide sequence of the Pseudomonas aeruginosa elastase structural gene. J Bacteriol. 1988;170:4309-14. Braun P, Ockhuijsen C, Eppens E, et al. Maturation of Pseudomonas aeruginosa elastase. Formation of the disulfide bonds. J Biol Chem. 2001;276:26030-5. Miyoshi S, Shinoda S. Microbial metalloproteases and pathogenesis. Microb Infect. 2000;2:91-8. Beaufort N, Corvazier E, Mlanaoindrou S, de Bentzmann S, Pidard D. Disruption of the endothelial barrier by proteases from the bacterial pathogen Pseudomonas aeruginosa: implication of matrilysis and receptor cleavage. PLoS One. 2013;8:e75708. Cathcart GRA, Quinn D, Greer B, et al. Novel inhibitors of the Pseudomonas aeruginosa virulence factor Lasb: a potential therapeutic approach for the attenuation of virulence mechanisms in pseudomonal infection. Antimicrob Agents Chemother. 2011;55:2670-8. Kuang Z, Hao Y, Walling BE, et al. Pseudomonas aeruginosa elastase provides an escape from phagocytosis by degrading the pulmonary surfactant protein-A. PLoS One. 2011;6:e27091. Le Berre R, Nguyen S, Nowak E, et al. Quorum-sensing activity and related virulence factor expression in clinically pathogenic isolates of Pseudomonas aeruginosa. Clin Microbiol Infect. 2008;14:337-43. Bergamini G, Silvestre D, Mauri P, et al. MudPIT analysis of released proteins in Pseudomonas aeruginosa laboratory and clinical strains in relation to pro-inflammatory effects. Integr Biol. 2012;4:270-9. Cowell BA, Twining SS, Hobden JA, et al. Mutation of lasA and lasB reduces Pseudomonas aeruginosa invasion of epithelial cells. Microbiology. 2003;149:2291-9. Zhu J, Cai X, Harris TL, et al. Disarming Pseudomonas aeruginosa virulence factor LasB by leveraging a Caenorhabditis elegans infection model. Chem Biol. 2015;22:483-91. Dickey SW, Cheung GYC, Otto M. Different drugs for bad bugs: antivirulence strategies in the age of antibiotic resistance. Nat Rev Drug Discov. 2017;16:457-71.